As an independent financial advisory firm with Certified Financial Planners (CFP®s) on staff, Crescendo works as a fiduciary for our clients, not for a brokerage firm or bank. This allows us the ability to give independent advice without having to fill any quotas. We are free to select the financial planning program(s) we believe best services our clients and which investment options best help our clients achieve their goals. 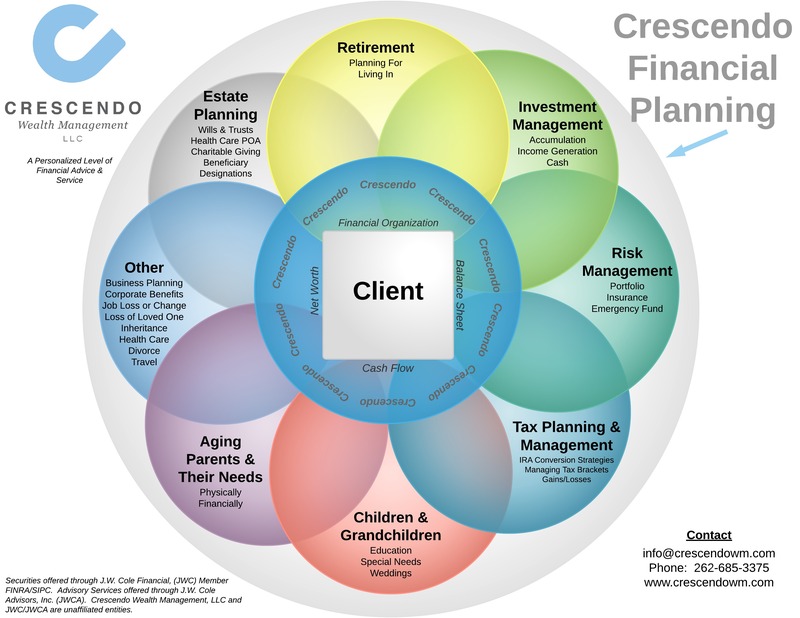 At Crescendo we offer holistic financial planning. To better illustrate what that means we have developed this Crescendo “bubbles” illustration. As you can see, there are many parts to your financial life. No worries, we work with you to understand each component of your life and how each overlap and interact. We believe that a client’s holistic financial plan only results from really thinking through and stress testing things for various market conditions and for areas that overlap and/or interact together. When it comes to thinking about retiring, we help you understand your company’s retirement package and options. We help you think through and get more information on your social security and Medicare options and what supplement health insurance costs might be and how this all looks in your long-term plan. We stress test your plan with various assumptions such as taking social security at full retirement age vs waiting to take it until age 70 or even taking it at 62. We’ll also help you investigate various ways to create your own pension and how to provide downside market protection if that’s important to you. To determine how much and what kind of life insurance a family needs depends on your unique situation. We spend time learning about your family longevity and health history. Become familiar with any employer provided or additional insurance you may already have, then stress testing how your plan looks if one spouse were to die tomorrow, or many years after retirement. Additionally, we also stress test those scenarios along with the idea that one or both spouses may incur long term care expenses during their lifetime. We then help evaluate whether the insurance you currently have best serves your needs, or are there other options you should consider. Along the way, we provide education to help you better understand all your options, allowing for a well informed decision. We also offer investment recommendations and management if you are interested. While we recommend meeting at our office so you can meet our team, we also recognize that is not always possible. Thus, we offer flexible meeting options including video conferencing, where we share our computer screen with you so we can all be on the same page. The option is yours. At Crescendo we offer flexible pricing options. We offer our services both via an asset under management, traditional fee approach or an out of pocket up-front fee with ongoing monthly, quarterly or semi-annual fee arrangement for services program based on your situation and needs. We provide this flexibility because we recognize that not everyone has investments easily managed by a financial advisor. For example, your assets may be in your employer’s 401k program or with an investment manager you like working with but doesn’t provide holistic financial planning. We invite you to reach out to us to learn more about our options to see what works best for you. Our firm’s FINRA & SEC regulatory, compliance and processing requirements are met by partnering with J.W. Cole Financial, J.W. Cole Advisors, National Financial Services (NFS) a division of Fidelity Investments & SEI Private Trust Company. Please visit our About Us Partners page for more information about these companies and how they oversee us and give you comfort knowing that our independence is being supervised by other entities to meet all regulatory requirements.